Despite all your efforts to guard your baby against illnesses, there were still factors from the environment that you can’t control, like the hazards from the air inside your home. During the winter season, humidity falls because of heaters and cold temperature. The dry air enables the viruses to thrive easily, and the risk of acquiring respiratory problem arises. In this situation, you might want to bring moisture to the air in your home. You should consider adding a humidifier to your baby’s moisture-deprived room. And because there’s a wide range of humidifier out there, you should be well-informed first before buying the best humidifier for babies. ​Why Do You Need One? ​Do you know that there are more than 100 different cold viruses around? And with that, your baby can get 8-10 colds each year? ​It is because your newborn has not yet developed immunity until they turn 2. Low humidity can inflame mucous membranes lining the respiratory tract. It increases your babies’ risk of sinus infections, like colds and flu and even dry skin. ​When the environment is dry, an infants’ respiration may struggle especially newborns who are “obligate nose breathers,” meaning that they can only breathe through their noses. Humidifying the air promotes ease in breathing, especially to people with asthma or allergies. 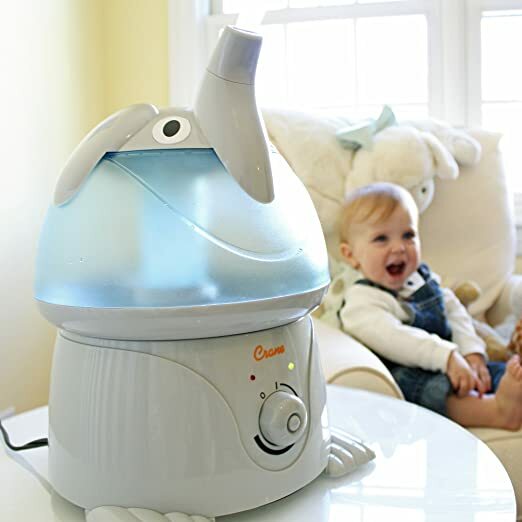 Since infants are susceptible to the effects of harsh air like frequent sore throats and stuffy noses, a humidifier can ease some of the symptoms and helps loosen build-up mucus that clogged the nasal passages. Specifically, the airborne microorganisms that survive in dry air conditions. Using humidifiers may help stop the spread and transmission of flu germs. Baby’s skin is delicate and sensitive; it gets easily irritated to very cold or dry climates. You can keep your thermostat lower since humid air makes you feel warmer, which also prevents dry skin. Adequate humidity can help to avoid worse skin conditions like eczema, rashes, and chapped lips. Some humidifiers for babies have built-in soothing sounds or white noise that may help your little one sleep soundly. Others have a warm-glowing night light, and if you want a stylish design to fit in your baby’s nursery, there are animal-shaped and colorful units available. ​Luckily, you can use your humidifier all year round; not only in the winter, to maintain the humidity level of your baby’s room which helps them sleep better. The Pediatrician may likely advise you to choose cool-mist humidifiers for safety reasons. A warm mist vaporizer uses boiling water to create steam which could be a burn hazard to your kids; cool mist doesn’t. The effect of cool mist tends to spread to a much larger area, so it is well-suited to equip most room sizes or even the entire house. Cool mist humidifiers can be evaporative or ultrasonic. Evaporative uses a fan to vaporize water through internal wick filter to a fine invisible mist. Since it uses a fan, it may be slightly noisier than other types. Ultrasonic uses high-frequency vibrations to release micro-fine mist into the air without making so much noise. It allows the highest level of humidity, killing off most bacteria since it uses internal heating that boils the water first before dispersing into the air. It works best on smaller areas like bedrooms and offices because the fine mist spreads only near the humidifier. Mineral deposits may be left behind from the boiling process, so cleaning is a little harder to do. However, many found these humidifiers comfortable since the absence of internal fan makes it exceptionally quiet to operate. Ultrasonic models are also available of this type. Your Space. Each humidifier is made specifically to cover small or large areas. Low Noise. The most common area to place a humidifier is the bedroom; so it’s no surprise most consumers want a unit with quiet operation. Automatic Shut-off. So you should worry of the humidifier still running, water drying up or the unit burning out. Refilling. A removable water tank is preferable for easy cleaning and refilling. Antibacterial features. Some humidifiers claim to have antibacterial technology that resists the growth of harmful microorganisms. Claims to be germ-free, this evaporative humidifier is a favorite for a lot of reasons. This humidifier uses ultra-violet light technology to kill bacteria, mold, fungus, and virus in the water which is then absorbed by the wicking filter before emitting an invisible mist. The sound level is of up to 25% quieter than others and may depend on the 3-speed fan output settings. Humidity level is not an issue on evaporative humidifiers where it doesn’t put too much moisture in the air than it can hold. In a low setting, it can run up to 24 hours in a full tank that can cover small to medium rooms. This ultrasonic humidifier does the job well with a lot of features. It works by filtering water from microorganisms and bad odor through a reusable microporous ceramic cartridge. The mist control can be set at low, medium and high with a rotatable 360-degree nozzle for the desired angle. Humidistat is available for ideal humidity level function and a timer to set it for up to 24 hours. The LED display shows the current operational modes which can be turned off through the sleep mode for your convenience and is quiet with less than 38 decibels of noise. It is very lightweight; you can easily move it around. The 4L capacity can last up to 15 hours in a low setting so that it will last efficiently through the night. It is relatively easy to clean as it comes with a brush to reach difficult spots. The bigger tank is a little bit hard to fill if you use a sink faucet. This Starry Night Cool Moisture Humidifier features a night time display of stars which is great in your baby’s room. The projector has an on/off switch that allows you to operate it independently. Aside from having a nice design, it produces humidification of the air through an antimicrobial treated filter that produces an invisible mist free from bacteria and other impurities. There is also a scent pad heater option that disperses soothing menthol vapors, plus it operates quietly so as not to disturb your baby’s sleeping. A 2-speed moisture output setting; high and low can be used for larger rooms and smaller rooms respectively. The 1.0-gallon water capacity can run up to 25 hours per refill, with the water level showing on the translucent tank. A multi-tasker that humidifies your space by using aromatic essential oils and operates with changing mood lights; kids will surely love in their rooms. It is a modern design humidifier and an aromatherapy device at the same time. The lovely fragrance it releases is calming to your baby as well as the quiet operation you want especially during bed time. The best feature about this product is the automatic shut-off mode; helpful when water runs out or if you want it to keep working while you aren’t home. Another is three-setting modes whether you want to use the mist continuously for up to 3 hours or intermittently for up to 6 hours. You can also choose to operate the color changing light without the mist. This Ultrasonic humidifier is made perfectly for your kid’s bedroom. There are 12 adorable animal designs to choose. The Elephant is one of the favorites wherein the mist comes out from its trunk. It works best with an antimicrobial material in the base to reduce molds and bacterial growth with an auto shut-off feature for your safety. The easy-to-fill removable tank will fit most sinks and is capable of 1 gallon of water that would run quietly for up to 24 hours. ​You might notice on our list that we did not include a warm mist type of humidifier. It is because, when it comes to your children, safety is our priority. ​All things considered, our best choice would be Honeywell Germ-Free Cool Mist Humidifier. It is much easier to clean and refill than other similar humidifiers on the list, and each tank lasts all night. It has all the benefits of a cool-mist with a relatively inexpensive price considering its quality. ​The air that your infant breathes is very important as yours or much more. Babies are so fragile and sensitive; you have to be extra-protective in guarding them especially in choosing products that you will be using for your little one. ​At the end of the day, the difference between is a matter of personal choice. It is still up to you to decide what features best suit your needs and preferences.